Today I started with the first HiFiBerry Digi tests. Unfortunately the PCB had some major problems. But with some bent pins and additional cables I was able to get the board running. I was also able to output sound already via the optical SPDIF output. That means, the development can go on. I will start developing the Linux driver for the board now. It is a bit more complex than the driver for the HiFiBerry Mini, because it needs I2C communication to configure the chipset correctly. However, I don’t expect major problems here. Stay tuned! This entry was posted in Projects and tagged electronics, hifiberry, raspberry pi, S/PDIF on December 1, 2013 by Daniel. Oops, the signal is inverted. But this is not an issue, inverting a signal in the DSP is a trivial function. That means we can now focus on the software development. The first step is the EEPROM functionality. With the onboard EEPROM the DSP works even without the Raspberry Pi (however without the option to control it over the network). The next step will be a universal filter designer that can be used for crossovers, equalizing and even room equalization. The software will be open source. Are you interested to join the software development team? Contact us! This entry was posted in Projects and tagged diy, dsp, electronics, fir on November 4, 2013 by Daniel. After some hours of debugging and fixing a hardware problem, the DSP hardware seems to work now. There are still cables soldered for I2C debugging purposes, but writing to the DSP works without problems now. I still have to work on reading data back from the DSP. Therefore the debug cables are still soldered. You also see, that the voltage regulator at the bottom is not used yet. I will do some comparison tests with a separate voltage regulator for the analog circuit. Looks good! The DSP now runs at 48kHz, therefore the triangle waveform is not exactly a triangle. But that’s what you would expect. 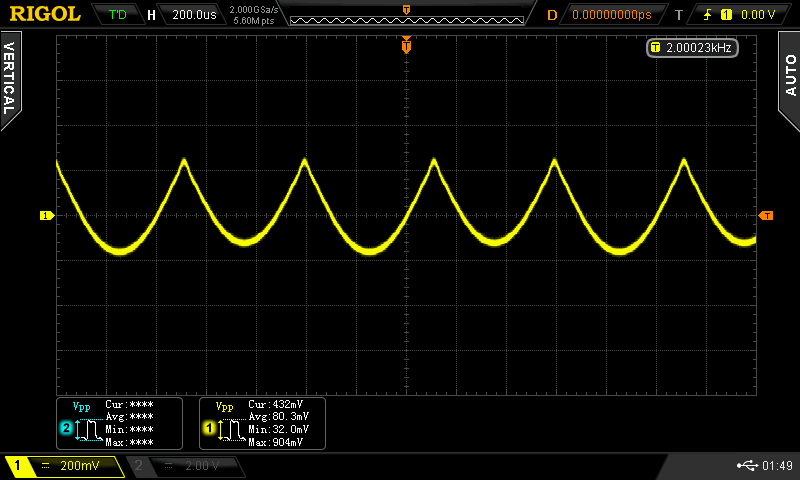 This entry was posted in Projects and tagged diy, dsp, electronics, oscilloscope, pcb on November 3, 2013 by Daniel. Here are some noise and distortion measurements of the HiFiBerry Mini DAC. Without the ethernet connected, noise is practically non-existing. But also distortions look good. D2 has the highest level and higher-order noise is decreasing with each order. This is really a nice chip. At 1kHz we see 0.0037% THD+N (distortions alone only 0.003%). However, the measurement equipment itself (an EMU0404) itself has a THD+N level of 0.002% at this frequency (in- and output together). Therefore the real noise and distortion figure might even be a bit smaller. Note, that these measurements are a bit flawed, because at higher frequencies there are less harmonics within the measurement frequency range than at lower frequencies. Therefore the distortions go down. Unfortunately I was not able the extract the D2 and D3 levels alone. There are more good news. The voltage regulation on the board works great. Even with the worst power supply I could find (a Nokia charger), the figures did not change much. THD+N went up from 0.0037% to 0.004% at 1kHz. That means there is no urgent need to upgrade the power supply of your Raspberry Pi. Update 1.12.2013: We did some THD+N measurements of our production version. They were even lover than the values show here. 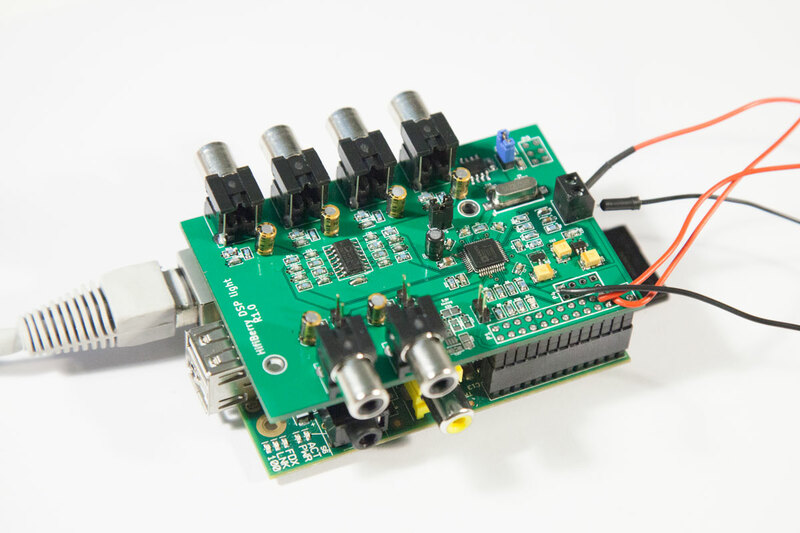 This entry was posted in Finished and tagged dac, diy, electronics, hifiberry, i2s, measurements, power supply, raspberry pi, sound card, voltage regulator on October 22, 2013 by Daniel. Many PCBs have a large ground plane where most components connect to. In simple microcontroller circuits, this usually works well. But for complex and mixed analog/digital circuits, you need to think a bit more how to route your ground traces. If you want to design your own PCB, have a look at this tutorial document from Analog Devices.